Murky. The best word to describe the weather this year so far. Grey skies thick with cloud, flat light, drifting mists. Snow yes, but even that has looked muted without the brightness that comes with sunshine. There has been subtle beauty in the layers of mist and cloud, an ethereal feel to the lack of contrast and definition, but you have to look to find it. Yesterday, the 19th, looked as though there might be a touch of sun, looked as though the clouds would lift from the summits, at least according to one forecast. Another suggested the mist would remain. I decided to ignore that one. 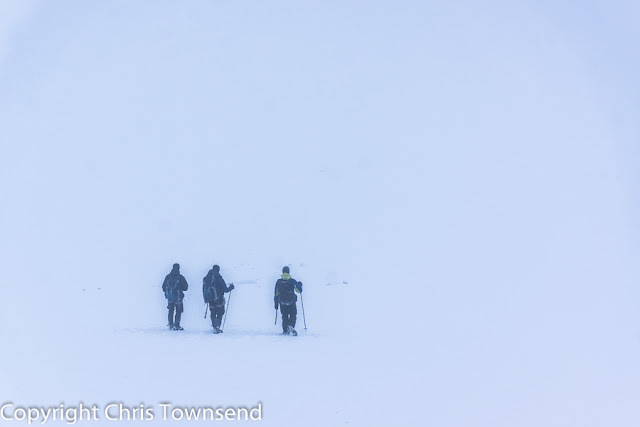 I really wanted a high level ski tour in clear weather, wanted to skim across the Cairngorm Plateau surrounded by a bright white snowy world. The start wasn’t promising. Overcast skies and hidden tops. Maybe the clouds would slowly clear I thought as I set off upwards, climbing skins on my skis. At least there was plenty of snow. The air was still and I was soon unzipping clothing and removing hats and gloves despite the freezing temperature. 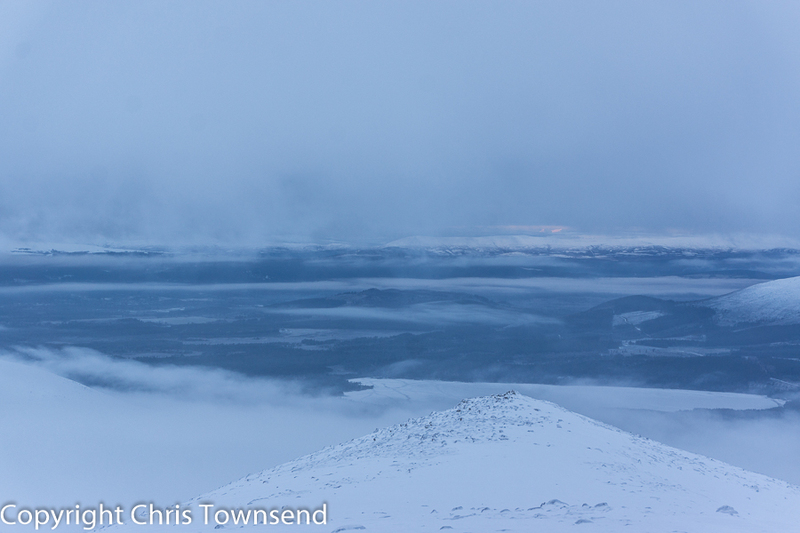 Below me I could see strands of thin mist moving lethargically along Strathspey. Soon I reached the indistinct edge of the cloud cap and the landscape started to waver and fade. There was a wind now, icy and piercing. Soon I could see no more than a few metres. Navigation was no problem. Just keep heading upwards. Every so often others loomed out of the mist, waving or calling a greeting before vanishing again. 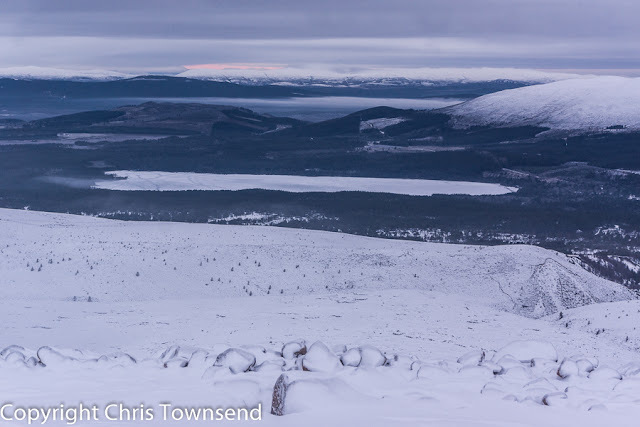 Eventually the big cairn at the top of the broad ridge came into view. I sheltered behind it while I adjusted my clothing and donned my goggles. The wind here was bitter and snow was starting to fall. My plans to head across the plateau to Ben Macdui had already been abandoned. Instead I’d take a shorter route over the tops of the Northern Corries – Stob Coire an t-Sneachda and Cairn Lochan – and then descend via Lurchers Gully. I headed down the gentle slopes to the base of the first peak. The cloud thickened. I could see nothing. My skis picked up a little speed and I instinctively braked. I knew what the terrain should be like but I couldn’t see it, couldn’t see any rocks poking out of the snow, couldn’t see if I’d veered off course. I stopped and thought. This looked like being a slow careful route finding exercise. With such minimal visibility my familiarity with the terrain meant nothing. I’d need compass, map and GPS and I’d need to consult them frequently. I checked the time. Unless the clouds cleared and I could speed up I’d be descending in the dark. Was it wise to continue? Did I want to continue? No was the answer to both. Turning I skied back to the big cairn, only seeing it when I was almost there. 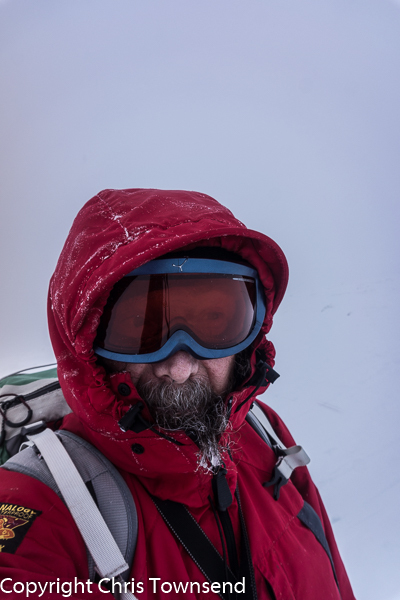 Slowly I went down the ridge, staying in the centre, peering into the mist. I still had the skins on. I didn’t dare let the skis run. Occasionally I stopped to stare into the whiteness, trying to pick out something, anything. Three walkers went past. ‘Bit of a pea souper’, said one before they were absorbed back into the greyness. Watching them at least gave me an idea of the angle of the slope. 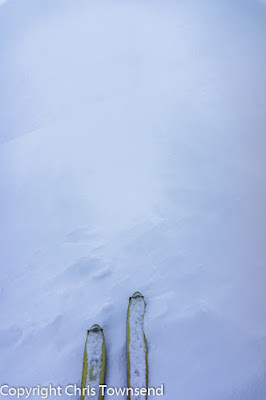 The cloud was descending with me, slowly sinking down the slopes. Finally the view opened up, stark and monochrome. Loch Morlich was cracked and pale, frozen hard. Far to the north a touch of colour in the sky showed that somewhere the sun was breaking through. Removing the skins I picked up speed and made the first turns of the season. Soon this first ski tour was over. I looked back. The mountains were still hidden in the cloud. I’d made the right decision.